Learn how to get the most out of the Materialise Mimics inPrint software to successfully create preoperative treatment plans or transfer DICOM imaging information from a medical scanner to an output file. On this page, you can browse our FAQ section, discover step-by-step instructions in the tutorials, or watch a webinar by a leading expert. Do you have a technical question that isn’t answered by the information? Click the ‘Contact Support’ button at the bottom. What is the difference between Mimics and Mimics inPrint? The Materialise Mimics Innovation Suite is a toolkit-based engineering package that was developed for advanced research and development projects that relate to engineering on anatomy. It is composed by Mimics and 3-matic and it has a range of possible configurations that your local experts can help you define based on your needs. Materialise Mimics inPrint is a workflow-based package developed to allow clinicians and hospital technicians to easily prepare a 3D model for 3D Printing, or advanced visualization based on medical images. Mimics inPrint can only be purchased by hospitals. What is the optimal scanning protocol for Mimics inPrint? Please find the scan protocols here. Can I import CBCT files? Yes, this is possible. Note that Mimics inPrint only supports DICOM images. Can Materialise print the anatomical model for me? Yes, we can. Please refer to your local office for further questions. How can I import images? What are the system requirements for Mimics inPrint? System requirements of Mimics inPrint are available here. What is the optimal imaging format for creating 3D anatomy models? What sort of medical software do I need to go from scan to STL file? Materialise Mimics inPrint represents the most comprehensive toolbox to go from medical image to STL file containing your desired 3D model. First, you start by segmenting the medical scans. Preparing and augmenting the segmented anatomy of your patient’s scan often constitutes the most laborious part of the 3D modeling process. This second stage can include features such as cleaning and smoothing to remove artifacts, adding connectors to hold anatomies in the proper position, adding thickness to represent vessel walls, cutting the model to achieve optimal visualization, as well as indicating color or multiple materials. What I should consider before designing patient-based 3D anatomical models? How can I verify the accuracy of the 3D anatomical model you created? Mistakes are easy to make. Before you 3D print your model, you should verify the accuracy of your final file against the original DICOM imaging. Did you over-smooth and remove a key feature from the model? Did you cut away a structure that could be a key landmark for the surgeon? By overlaying the STL surface on the original DICOM data would be the most efficient way to validate the accuracy of your result. This also allows you to make subtle adjustments or refinements to the model. Why should I label the 3D-printed parts? And how? The traceability of your 3D-printed models reduces the error risk within your 3D printing framework. As you scale your operation and start creating greater volumes of anatomical models, it is critical to know which part belongs to which case. To reduce the risk of mixing up models or, worse, providing a surgeon with the wrong anatomical model, each 3D-printed model should be labeled prior to printing: the medical 3D modeling software Mimics inPrint allows you to do so. Use a requisition number referring to the medical records to ensure the traceability of your 3D anatomy models. Moreover, labels are required if you want to create mirror images or want to indicate what side of the patient the model was derived from. This will help reducing the chances of the surgeon getting confused. You can easily label the model during the creation process by using the tool 'label’. How can I ensure the 3D printability of the created STL file? The STL file format is the universal digital 3D-modeling format for 3D Printing that will be fed to a 3D printer so it can slice and build the required part. However, not all STL files are created equally. The number and quality of the triangle facets will determine the eventual quality of your 3D-printed model. Sometimes, very thin walls in the model may fall below the minimum resolution of your 3D printer or will end up being brittle and tear-sensitive. Before proceeding with the actual 3D printing, please make sure to use the 'STL diagnostic and fixing tool'. This tool helps you ensure that your model can be technically 3D printed while also taking into account the shape and thickness of all walls. Why use 3D-printed anatomical models? The applications of 3D Printing in medicine are expanding. The 3D anatomy models created with Materialise Mimics inPrint and printed with compatible 3D printers can be incorporated into the clinical framework to facilitate a realistic 3D view of the pathology, enabling a multidisciplinary communication leading to the best patient-specific treatment proposal. Additionally, 3D-printed models can be used as an educative tool both to train tomorrow’s medical experts and try out surgical procedures before entering the operating room. Moreover, 3D anatomical models can help improve your patient communication. The most frequent clinical cases where 3D anatomical models have proven to be useful include cardiovascular cases ranging from structural cardiac defects to congenital heart diseases; complex fractures, cranio-maxillofacial reconstructions, genitourinary surgery, and more. I have an STL file, how do I start with 3D printing? First, we recommend estimating the total volume of cases your department or hospital wants to 3D print and, based on this estimate, comparing two approaches: insource and outsource. Outsourcing 3D Printing allows you to minimize your upfront investment, but is typically associated with longer lead times. Outsourcing can, however, be advantageous in the rapidly evolving market of medical 3d printing companies. What you invest in today, could soon be obsolete as more advanced and lower-cost technology is brought to market. From a purely economic standpoint, outsourcing the first cases would be the best strategy. Insourcing gives you control over the complete process and enables you to create models faster for urgent cases. This step does, however, require a considerable investment. Alternatively, desktop 3D printers offer a great solution to make your first steps in in-house 3D Printing. The following list of printers been validated for use with the FDA cleared Mimics inPrint software for the creation of diagnostics 3D models. What else can I use Materialise Mimics inPrint for? Not every case needs to be 3D printed. In addition to the STL file, you can use Materialise Mimics inPrint to generate a 3D PDF to visualize the accurate 3D anatomy model on your screen and share it with your team. Some hospitals even insert a 3D PDF into the medical report. What is the average cost of printing 3D anatomical models? The cost of 3D Printing is mostly influenced by the technology used and the overall size of the part you wish to print. Relatively small-sized models, such as a baby heart, printed in a single color using desktop stereolithography (SLA) probably cost up to a few tens of euros. Larger multi-color, multi-material models, such as a liver model, could easily reach up to a few thousand of euros. For a more accurate assessment of the potential technology and its associated cost for your hospital, please contact us. How to implement 3D Printing in my hospital? Successfully deploying a point-of-care 3D Printing is a staged process. The golden rule says: start small and lay out a plan for growth. By launching on a small scale, it will help build momentum with clinicians and administrators to support the activity. Make sure to learn from experts in the field. Master the process from image acquisition through 3D printing. This will ensure that you avoid common pitfalls and operate in the most efficient way possible. Watch this webinar to learn more on how to succeed in deploying 3D printing for medical use. What 3D Printing technologies are suitable for 3D Printing in medicine? Professional 3D printers come with different technologies, and all of them have their advantages. FDM, PolyJet, laser sintering, stereolithography and ColorJet Printing all bring unique advantages for specific applications. Resolution, speed, materials, color, and, of course, cost are all key factors you should consider. We recommend consulting industry experts to understand what technology makes the most sense given your case volume and available budget. In addition to determining the most appropriate 3D printer, you’ll also need to think about the space required to house it. Certain printing technologies take up a very small area, while others may require dedicated facilities. Some machines need additional equipment to clean the models after printing, others come with higher maintenance requirements. It is necessary to fully understand all of these considerations before making your choice. Who should be responsible for a Point-of-Care 3D Printing in your hospital? Running an effective Point-of-Care 3D Printing in your hospital requires a specific skill set. Firstly, an accurate segmentation asks for a team member with a thorough knowledge of imaging and anatomy/pathology. Next, preparing 3D models for 3D Printing requires some engineering skills. Additional resources may be needed to clean 3d-printed anatomical models and maintain the machines. Above all, the scale of your operation will determine the resources. There is, however, one overarching requirement for all team members: to be part of a bigger network allows you the tap into the latest trends and innovations by, for example, attending relevant events and workshops. How can I empower the model request communication within my hospital? Fostering a close collaboration between staff members is key to effective communication. The scope and use of the 3D-printed model should be defined in consultation with the surgeon or interventionist before starting the process and verified towards the end. This can be facilitated through web meetings or face-to-face discussion. Additionally, it can help to have a software solution capable of exporting a file format that can be examined by the surgeon. It is possible the surgeon in question will not be able to open an STL file. Exports such as 3D PDFs can be an excellent tool for this purpose. Start small and lay out a plan for growth. Launching on a small scale will help build momentum with clinicians and administrators to support the activity. Make sure to learn from experts in the field. Master the process from image acquisition through 3D printing. This will help you avoid common pitfalls and make sure you operate in the most efficient way possible. What can I expect from the trial period? The trial grants you 90 days of full access to the Mimics inPrint medical software, and starts once you click the ‘get now’ button in the syngo.via open apps store. You will have the opportunity to create your own specific 3D anatomy model while getting the most guidance as you go from medical scan to 3D visualization and printable file. You will get additional information on your trial and the use of the software sent to you through e-mail. Can I replicate available workflows on my own data? Materialise Academy offers you a series of representative workflow videos illustrating how to create specific 3D-printed models using medical software. These workflows can be replicated on your own data sets. Are there other benefits to having Materialise Mimics inPrint integrated within the syngo.via platform? Integrated in your clinical environments, the software holds fast and efficient 3D printing workflows with a direct link to 3D printing as a service or in-house. The integration in syngo.via facilitates the efficient transfer and exchanging of data, as well as archiving the results. What are the minimal requirements to run 3D medical software? The Materialise Mimics inPrint software available in OpenApps runs on the existing Syngo.via hardware setup. You do not require additional hardware or software. Please contact your Siemens representative for more information. For a direct deployment of the software, please refer to our minimal system requirements. Can I use the Mimics inPrint software on multiple computers? Materialise licenses the Mimics inPrint software based on a single concurrent user and does not restrict the number of computers on which the software can be installed. For installations within Syngo, via OpenApps, all workstations running the Syngo.via software can access the software. Is this a modular software or a one size fits all? The Mimics Print software is modular. Different modules correspond to different clinical interests, such as creating 3D bone models or designing vascular models. During your 90-day trial on OpenApps, you will have access to the fully featured version. Depending on your needs, you may prefer to configure the software differently and we are happy to suggest a more suitable configuration. Your Materialise contact person is always there for you to make sure you benefit from the best setup available. Can I extend my trial after 90 days? While we cannot extend your trial on the syngo.via OpenApps platform, you can always contact us to find the best solution for you. Feel free to reach out to us. What is the next step if I wish to continue using the 3D software after the trial? During your 90-day trial period, we provide you with additional information regarding your trial and inform you about the different ways to get in touch with Materialise. We recommend you to reach out via any of these channels to talk to your Materialise representative. They are happy to create a custom offer that meets your needs. Once approved, we will activate your license for the agreed-on duration. For detailed instructions, please read the article. 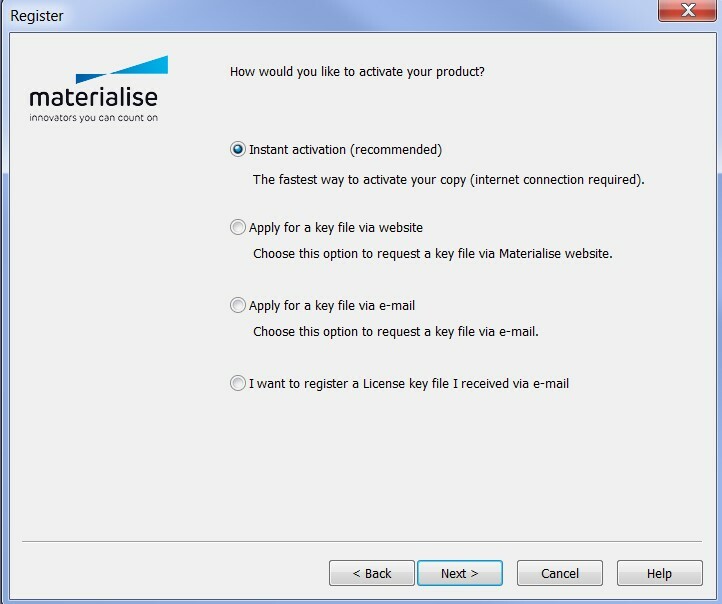 How do I install my Materialise software product? 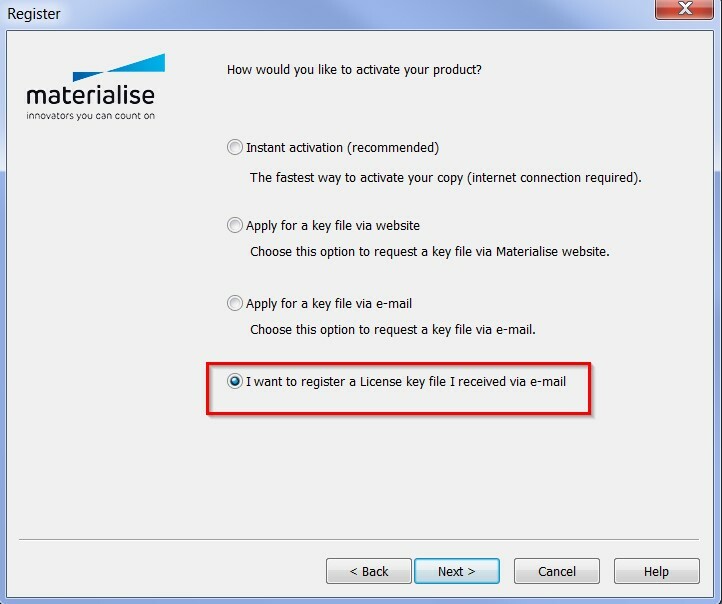 We recommend that you close all other applications before installing your Materialise software product. You must have administrative access to install the software. How can I register my software? In order to register and activate your software, you will need to install it first. Upon completion of the installation, the registration wizard will open. Depending on the type of license that you have or want, you will need to select one of the 'evaluation', 'license' or 'floating license server' options. To activate your software without a key file, you need an internet connection and a valid license (CCKey or voucher). After installing and running the software, the registration wizard will open. To activate your software with a key file, you must have the key file already. Save the key file you have received (.matkey) in a local folder on your computer or on an external storage device. 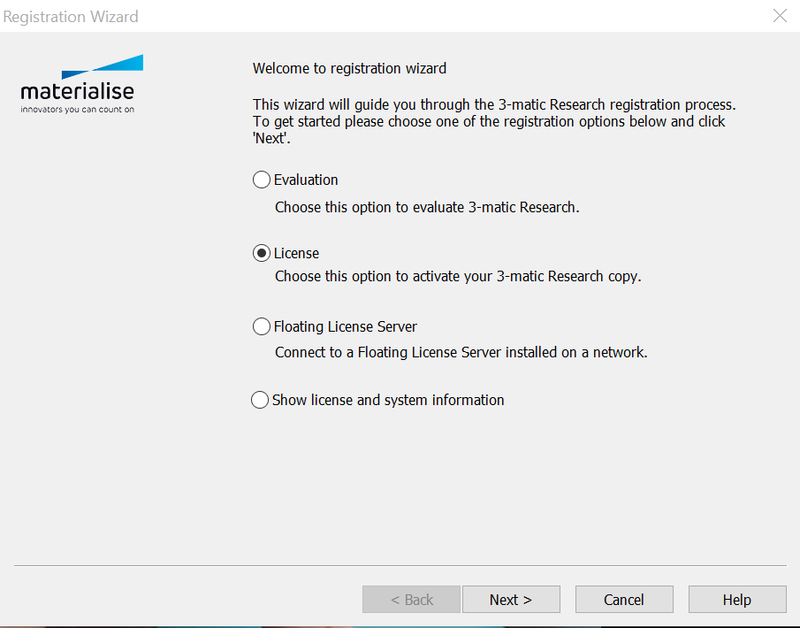 After installing and running the software, the registration wizard will open. How can I reactivate my software in case of emergency? Every software license that is under maintenance comes with the possibility of obtaining an emergency key file. This measure exists in case your software deactivates by accident and the normal reactivation process does not work. This key file reactivates your software for six days, which allows you to continue your work in case of emergency, while our support team will help you to reactivate your software. Please note that you can only obtain a limited amount of emergency key files, depending on your maintenance package, so it should only be used in an emergency. How long will my software remain activated? You can consult the expiration dates on the password website after logging in with your CCKey or voucher code. A license means having the right to use a Materialise software product under certain conditions. If you have a valid license (in the form of a CCKey or voucher), you will be able to activate your software. If your license is no longer valid, you will not be able to run the software. Depending on the type of license you have, you can renew it or prolong it after contacting your local office. Perpetual license (only available in academic institutions): This is a commercial license that allows you to use the software for an unlimited period of time, with the exception of a license termination. An annual maintenance renewal will ensure that you are using the latest software version at all times. Why do I receive a password for only 2 or 6 months, even though my license lasts longer than that? We safeguard our software by means of using security password files. About every 6 months, we change the way a password file is generated. Therefore, you will need to renew your password file every 6 months. You will still be able to use our software as long as you apply for the renewal of your license password file – this is free to do! If you bought a new license and the payment of your license was not registered in our system yet, you will only receive a two-month password file. This is because we allow our customers to activate their license once we receive the order, and before we receive the payment. Once the payment is registered in our system it will be possible to generate six-month password files. How do I set Mimics to automatically update the license? When you have a Floating License Server, go to License and select "Auto Update License". If you have a local license, you can set Mimics to automatically retrieve license updates. To this end, go to Options, choose "Modules" and select the option "Password Requests". Enable the option "Let Mimics automatically contact the Materialise password server to update the licenses". You will need a CCKey to enable this. Please note that you also need internet connection to benefit from this feature. How can I set up a floating license server? Please consult our Floating License Installation Guide for more information. Your System ID is a code generated by us that is unique to each computer or server. To find the System ID, you will first have to install your Materialise software product. What’s a(n) (emergency) key file and how can I obtain? A key file is a small file (*.matkey) that will activate your software license. The key file is unique to each system (it is based on your System ID) and can only be obtained if you have a valid license (CCKey or voucher). For detailed instructions, please read the article. What’s a CCkey and where can I find it? The CCkey is the unique code that specifies your Materialise software license. If you have multiple Materialise products, you will have multiple CCkeys. The CCKey is needed to activate your license, but also for future downloads, upgrades and other occasions. The format of the CCKey is xxxx-xxxx-xxxx-xxxx. Your CCKey is communicated to you by e-mail and/or mentioned on the invoice. If you ordered your software in CD format, the CCKey can be found on the inside of the CD sleeve. If your license has already been activated, you can find the CCKey in the system information of the software, via the registration wizard. If you do not have a CCKey, please contact your local office. 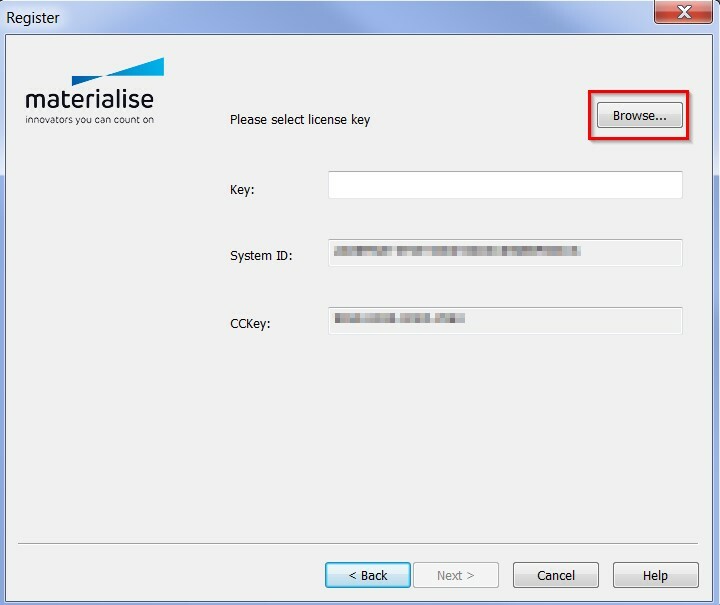 You can also verify your CCKey by opening your Materialise software. Go to Licenses under the Help menu and select "Show license and system information". If you have a CCKey, it will be shown at the top. What’s a voucher and where can I find it? 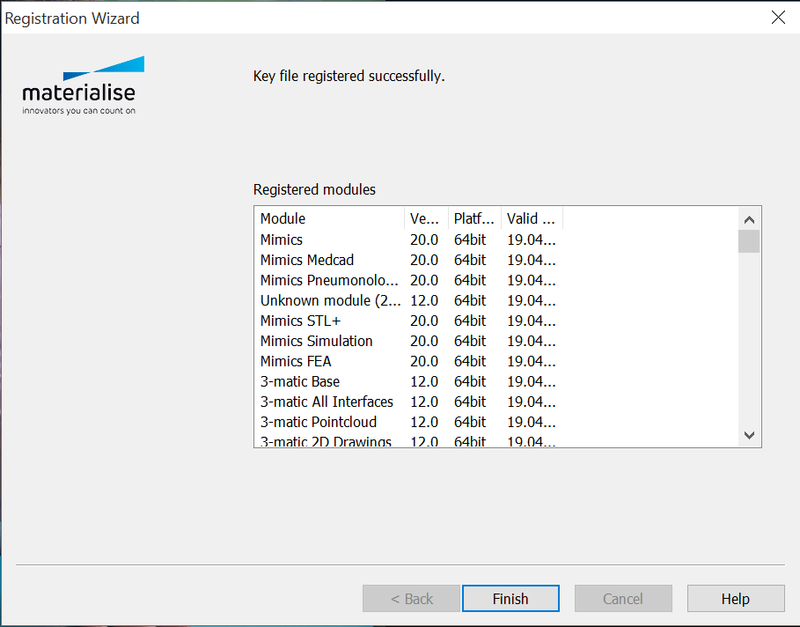 A voucher is a unique code, just like a CCKey, that activates your Materialise software license. Unlike a CCKey, a voucher is not necessarily connected to a commercial license but will often serve to activate evaluation licenses. The format of a voucher is xxxx-xxxx-xxxx-xxxx. In most cases, your voucher will be communicated to you by e-mail together with the download link for your software evaluation. If you do not have a voucher yet, please register your software (by choosing an evaluation license) or contact your local office.